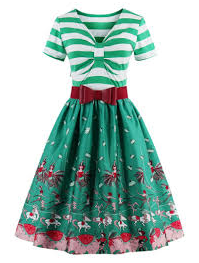 Get a 50s look and enjoy the Christmas Eve in a vintage style with this kitten pattern swing dress. On the bodice, it has a mesh insert with Swiss dots detailing. Available in black, bright red, deep red and green and all plus sizes, this kitten pattern dress is ideal for any party occasion. Crafted from polyester and spandex the dress features vintage look, round collar, knee-length, A-line silhouette, and can be an ideal pick for fall, summer, and spring. Ideal for the festive season this dress offers you an elegant and adorable look. Made up of polyester the dress has timeless black and red color contrast bodice and silhouette. 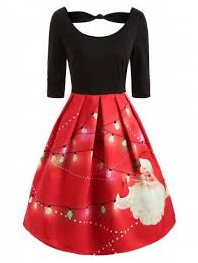 The dress features A-line silhouette, knee length, round collar, half sleeves, and a beautiful Santa Claus pattern on the silhouette. Choose as per your choice from red, black and jungle green. If you have plus size and not finding a dress which suits your figure and style then pick this flared dress with a classy striped pattern tee panel and a cute Christmas print pattern on the skirt. The dress is ultra-cute and fashionable and is suitable for any Christmas party. Fabricated from polyester the dress features V-neckline, mid-calf length, high-waisted, A-line silhouette, cartoon, and striped pattern, and short sleeves. Embrace yourself with a casual and cool look on Christmas Eve with this aesthetic t-shirt dress embellished with stripped allover and Christmas silvery deer in the front. The dress is crafted from cotton and polyester and features casual styling, a shift silhouette, mini dress length, long sleeves and perfect for fall season. Pair the dress with distressed jeans to complete your festive look. Available in white and green this Hepburn style dress gives an elegant and classy dash to your style. 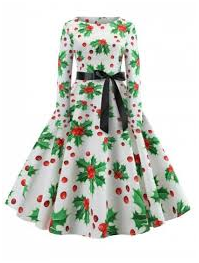 The dress has A-line silhouette, round neck, and retro style Christmas print all over. It has back zip closure, long sleeves, knee length, and available in all sizes from small to 2XL. See more details here.